Posted by Bravado Cooking for Men in Classic Asian Dishes, Classic Vegetable Dishes. 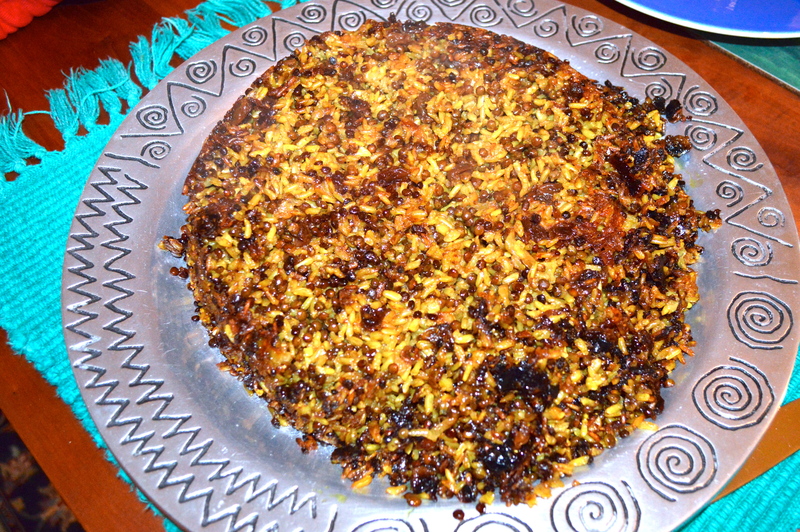 This is a great dish from Central Asia and has a thousand variations. 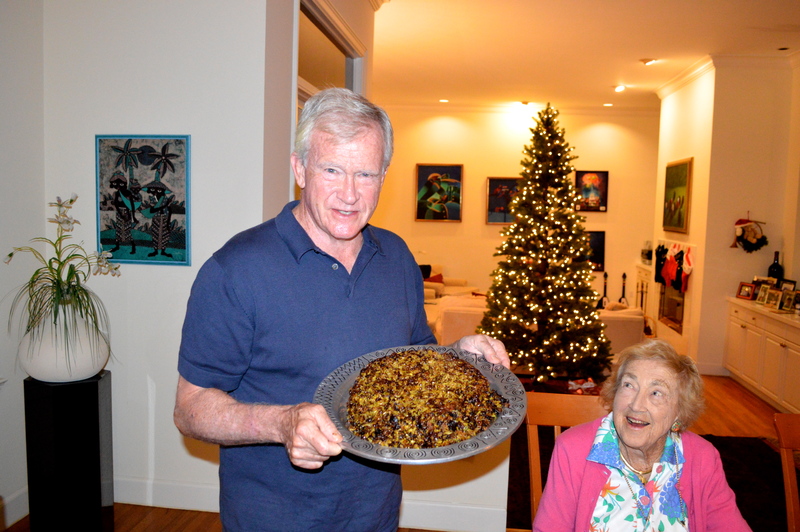 It is a wonderfully showy dish for the holidays and makes a great addition to any meal. Mark Bittman has a number of suggestions in his great book “How to Cook Everything Vegetarian”. This is my own version and it shows promise. At a recent dinner party, it was gobbled up. The basic idea is to partially cook the rice and lentils, mix them with some interesting spices and vegetables, and then pack them into a pot with enough butter to avoid sticking and burning. When finished, you flip the pan as you would a tarte tatin and hope that it comes out in a nice cake like the picture above. If it doesn’t, don’t worry – the taste is the same. 3-1/2 qt. saucepan or whatever you would use to cook rice. It must have a tight fitting top. Bring a pot of water to boil, add the rice and lentils and a tsp. of salt. Cook for 20 minutes and then drain in a colander. While the rice and lentils are cooking, sauté the onions and red and Jalapeño peppers in two tbsp. of olive oil. After about 3 minutes add the garlic and continue cooking until onions begin to carmelize. Set aside in a mixing bowl. Mix the curry powder and tumeric in ½ cup of water. Heat 2 tbsp. of olive oil in a small saucepan and add the curry mixture. Cook and stir for about 5 minutes until the mixture begins to thicken. Add the sautéed vegetables and stir to coat well. Add the curry mixture and the raisins to the rice and lentils and stir well. Melt the butter in the pot you used to cook the rice and lentils. Slosh around to get some of the sides coated. Pour the rice, lentil and curry mixture into the pot and press firmly to bottom and sides. Sprinkle ½ cup of broth over the top, cover tightly and cook on high heat for about five minutes until you hear the liquid begin to boil and hiss. Turn the heat down to medium-low (but not too low) and cook untouched for 40 minutes. If you lid is not tight fitting enough, you can put a dishtowel over the pan first and then the lid, folding any excess onto the top of the lid. This is a traditional move. When finished cooking, remove from heat and let sit quietly for 15 minutes. 10. Uncover and put the serving dish upside down on top of the pan. Pressing the serving dish tightly to the top of the pan, quickly flip it, remove the pan slowly and see what you have. You can experiment to your heart’s content with this rice. Add meat, use yogurt instead of chicken broth – whatever you want. Don’t forget to let us know about your adventures. I should have mentioned in the post that the combination of lentils and rice contains all eight amino acids for a complete protein. You don’t need the fat-laden beef.